that provide simple, logical advice for dealing with some of the day-to-day challenges that we all face, and explores how we can live more purposefully. AUDIENCE Anyone. Any industry. All levels of staff. Also suitable for client or stakeholder events. Ideal for those occasions where staff are invited to bring their partners. OCCASION Sales conventions. Client events. Ideal for incentive events or when your people need a motivational or inspirational boost. OUTCOME Motivate and inspire your people with a message they will never forget. 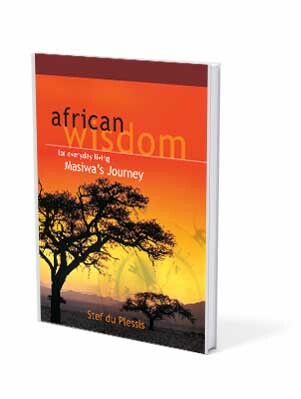 OPTIONAL RESOURCES Give each delegate a copy of Stef’s book, ‘African Wisdom’, which contains everything that he will cover during this presentation, plus a lot more. Available in paperback or as an online e-book. One of South Africa’s most influential motivators. Wait before you go! Download your free e-booklet. "How Workplace Cultures Stifle Performance And What You Can Do About It"
In the e-booklet we will share with you the 5-Step approach for embedding a workplace culture that improves productivity and drives performance. By clicking 'Claim Booklet', you confirm that you have read and are satisfied with the terms of our Privacy & Cookies Policy.